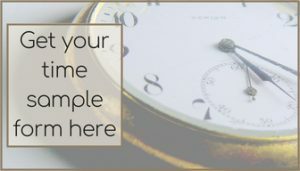 If life often feels like a whirlwind, or you end your days feeling the weight of undone tasks and mismanaged time, you are in the right place. 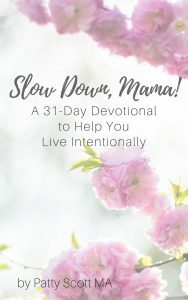 In Slow Down, Mama, I share with you my story of growing from overly busy and depleted, to content and purposeful. 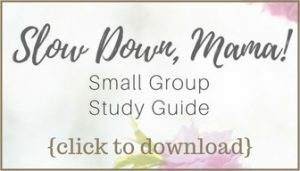 First we look at the reasons we become overly busy, then I lead you as you discover your deeper life purpose, and finally I equip you with personalized habits so that you are able to love intentionally and slow down to make room for what matters most. If you want to dig deeper, I offer coaching sessions to help you with specific areas you want to work on developing. Maybe you read the book (or are reading it now) and you find yourself stuck in one particular area. We can set up two half-hour video coaching sessions. During the first session, we will look at where you are stuck and develop an action plan. Then, around two weeks out from our first session, we will meet again to discuss how you are doing and make any adjustments you might need. To sign up for coaching sessions, please fill out the contact form on my coaching session page. I look forward to working with you. Nothing brings me more joy than helping women grow and find the life they were intended to live. I am also in the process of developing a 31 day devotional to help you apply the concepts in the book while digging deeper into God’s Word. By Spring 2019 we should have some online courses (4-sessions each) to help you dig into concepts like finding your purpose, overcoming perfectionism, cultivating meaningful relationships, building in rest and margin, developing a personalized planning system, and more. 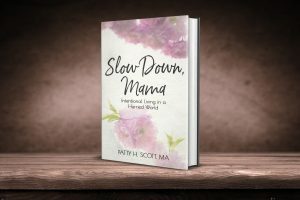 If Slow Down, Mama has been a blessing to you, I would absolutely love to hear about it. Please share your testimony here.